Digital distractions both during classes and while students should be studying are a huge problem among today’s undergraduates. 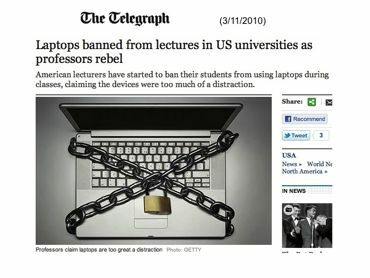 Some colleges and some instructors have attempted to forbid computers during lectures, but these attempts are not always successful and only address the time students are in class. The best way to get people to overcome digital distractions is to teach them how the brain works, which motivates them to change their behaviors because they feel it’s in their own best interest, rather than because someone else tells them to. Multitasked learning is at a lower level, producing knowledge that is more superficial and less generalizable. People who multitask the most are the least effective at it. Workaholism is counterproductive; what works better is periods of focus interrupted by well-timed break periods. “Low-information” breaks involving exercise, nature, and sleep work better than breaks involving TV or the Internet. In a nonjudgmental way, students are left with concrete strategies that help them work more effectively, become more creative problem-solvers and better paper-writers, and experience less stress and burnout. In spite of the fact that this advice should be a “hard-sell” to this generation of students, this information has been very well received. Evaluations indicate that the students love the brain exercises and believe the conclusions because they experience the effects on themselves. They find the information new and useful, and many of them try out the advice and find that it helps. This presentation provides techniques for supporting students in these efforts. It also helps attendees manage their own digital distractions. A combination of “Thriving in Cyberspace” for students and “Getting Students to Turn Off Digital Distractions” for counselors and educators works very well to create a mutual ongoing support system for college success. I thoroughly enjoyed Dr. Cantor’s presentation at the 2011 Annual Conference on the First Year Experience. She offered innovative and relevant ideas illustrated by simple examples and interesting allegories (who knew the human brain and a jar of jellybeans had so much in common?!). Her depth of research makes her a qualified expert on the issues concerning concentration and technology’s influence on Generation Y, as well as strategies to combat and embrace it. Dr. Cantor was engaging and entertaining, and I highly recommend her presentation to students, parents, counselors, and educators. This is an excellent presentation—something I will put across not only with my students in class but with my children at home. The exercises—Stroop Test and Cantor Test—were very eye-opening. I appreciated the modeling of strategies and the suggestions that are easy to implement. Relevant for students and just as useful for me! I look forward to trying out these tips in my classes and in my own life. Thanks for sharing these convincing explanations and activities to help students manage their time and toys better. I came to this session thinking it would help me with my students in my classroom. However, it not only helped me with that but also hit home for myself. I multitask all the time and didn’t realize how unproductive it can be. Great session. I’m excited to use these ideas when talking with students at my University. Thanks for sharing this information. Not only is this helpful information for students, but it’s also very relevant for college faculty and staff. Great strategy for helping students understand “why” — which they don’t always get when we share success strategies with them. Enjoyed the show vs. tell attitude. “Left to our own devices . . . twitter our lives away” was LOL funny. Plan to spread the word!! Terrific. Valuable and relevant to learning experience—especially freshmen. We must share this knowledge with students and faculty. This is a great topic for first-year seminar students. I really loved the research that you provided on how the brain works. Not only will I use this information with my students, but with myself, too. I found the nonjudgmental approach important. In addition to discussing these ideas in my courses, I plan to use the information with my teenage daughters who live for texting and Facebook. Wonderful. I loved the quick interaction activity at the beginning that shows multitasking does not work. Can’t wait to tell my classes about this lecture! Very helpful. I found the information to be personally meaningful as well as something I will use with my students. I appreciate having practical, tangible strategies and behaviors to both incorporate in my own personal and professional life and give to my students. I also appreciate the nonthreatening approach to use with students. “Focus, and then relax” is highly appreciated. Thanks! Now I can with confidence tell my students not to multitask. “Just focus and try to have fun relaxing your mind and body.” I’ll try to implement what you enlightened me with. Thoughtful lecture. Excellent integration of research, activities, and application. Good & entertaining — kept attention with humor AND good info. I would absolutely recommend this! I was personally challenged and inspired to adhere to these new suggestions. Your explanations were very valuable to help justify why it is good to follow the suggestions. “Awesome! Anyone can use this info, regardless of age, job, etc.! “Really great concept! I want to integrate this into my work!